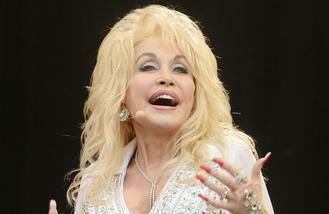 Dolly Parton has unveiled the tracklist for her new album 'Pure & Simple'. The 70-year-old country legend has announced she will release her 43rd studio album on August 19 and it will have nine songs including 'Tomorrow Is Never' and 'Forever Love', which see the buxom blonde return to her roots, something she's really excited about sharing with her legions of fans. She said: "I may not be pure, but I'm as simple as they come. This new project is really special to me, because I'm taking my fans back to my roots. I feel like these songs have a pure, tender side and we didn't go overboard with arrangements. I'm so glad we've teamed up with our friends at Sony to get this album out to the fans." Dolly has also decided to give her fans a copy of her performance at Glastonbury Festival from 2014 with her new record. The '9 to 5' hitmaker played the "legends" slot on the Pyramid Stage and even recorded a new song for the special occasion called 'Mud Song', which is included on the live CD as well as her full set. 'Pure & Simple' is Dolly's first album since 2014's 'Blue Smoke'. Beyonce has paid tribute to the five police officers killed during a night of violence in her native Texas. Fergie performed her first UK gig in three years at Wireless Festival on Sunday (10.07.16). Nick Jonas finds food gestures to be rather "romantic". Duran Duran feel "motivated" by their past successes. Clean Bandit were amazed by Sir Elton John's piano playing skills when they were recording tracks together. Rita Ora and Cara Delevingne are apparently on track to becoming best friends once again. Franz Ferdinand's guitarist Nick McCarthy has parted ways with the band. AC/DC's Cliff Williams is to retire after their 'Rock Or Bust World Tour'. Ariana Grande has joined the cast of the U.S. TV Hairspray event.